The fate of the Tasmanian Tiger has been the subject of intense debate and investigation since the last known Thylacine died in captivity on 7 September 1936. 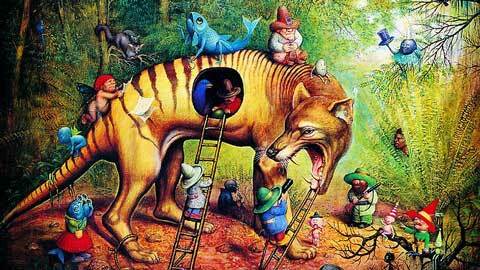 The Tasmanian Tiger has an almost mythical status. The area is so damn remote, there are so many prey species and we have so many reliable witnesses who know the bush that I’d say there is a reasonable population of them left. … The people who say they’ve seen it have nothing to gain and everything to lose. I’d say there is a population of at least 300 of them. But is Survival of the Species Plausible? There is no doubt that Tasmania has plenty of remote wilderness that is rugged and virtually impenetrable to humans. It is possible that, if native animals were living in the thick bush, they could go for quite some time without detection. 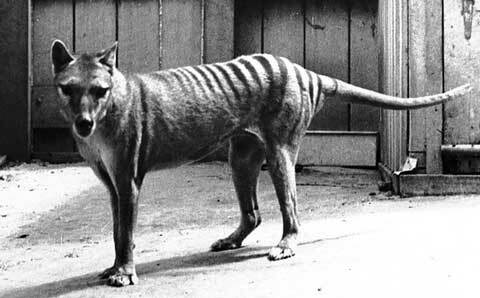 A 1930s photo of the last known Tasmanian Tiger. But there are two very good reasons why we can be sure the Tasmanian Tiger is extinct. The first is that the Thylacine was struggling to survive before European settlers arrived in Australia. It was already almost extinct on mainland Australia. The Tasmanian population was stronger but numbers were quickly decimated by hunters. a single thylacine often killed several sheep in a night, merely sucking their blood and eating a little of the kidney fat. Second, the only “evidence” we have of the species continuing beyond the 1930s are “eyewitness” accounts. These are not plausible. Anyone who has watched Bigfoot Hunters has had the opportunity to starkly see the fallibilities of human perception. These guys are hunting for giant human-like creatures who apparently live quite close to populated areas. The Bigfoot myth is impossible to believe and yet we have eyewitness sightings. Without any firm evidence emerging, there is no other sensible conclusion to draw: bigfoots simply don’t exist. It would be impossible for a large creature with human-like needs to maintain a viable population and go undetected. And yet there is no shortage of bigfoot believers. Every Bigfoot Hunters episode draws out multiple eyewitnesses swearing to have seen these mythical creatures. 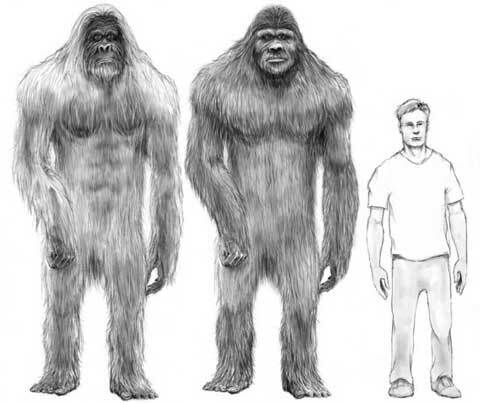 The bigfoot phenomenon demonstrates that, by themselves, eyewitness accounts of seeing a rare creature do not constitute evidence of its existence.